Today, you have the ability to monitor your home while you’re away from it, adjust the lighting before you even walk into a room or water your home garden while you’re away on vacation. But, does making a product ‘smart’ or ‘connected’ really make it better? Will it actually be making your life more efficient? Michelle Wagner, an architect at New York’s Wagner Studio Architecture, works with clients to help source the best appliances for each personal space in the process of creating architectural home plans. She says for so many of her residential clients, “The perception is that it’s still just bells and whistles and why would I need that?” So despite these new, cool gadgets on the market—from ones that can transform your lights into motion sensors, to webcams that can differentiate between people, animals and cars or an Android tablet that can act as your heating/cooling controls—that still doesn’t mean that the mainstream is ready to use them…just yet. At Whirlpool’s connected home showcase at CES 2016, its Smart French Door Bottom Mount Refrigerator (out in summer 2016 for $3,800) is not only designed to offer smarter food storage with a new pantry-style design, but it also has additional lighting and re-designed modular shelving so users see and access contents more effectively. Plus, the refrigerator works with the Nest Learning Thermostat so you can be alerted when there’s been a disruption to the refrigerator’s power (your cue to be sure food hasn’t spoiled), or if a filter needs changing. 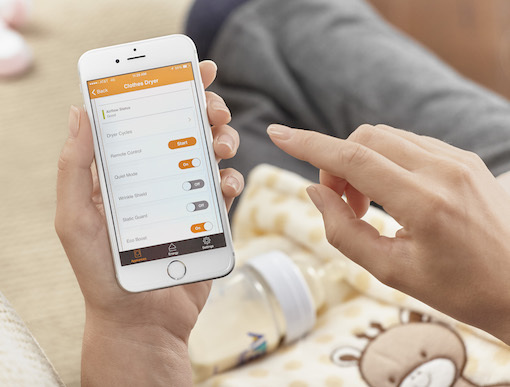 “One of the challenges with the connected home is being able to explain to consumers the true benefit and true value so they don’t just think you’re adding tech for tech’s sake,” Lindstrom says. Any features that are integrated must actually add value, she says. For instance with Whirlpool’s Smart Top Load Washer and Dryer, users can sync the Whirlpool mobile app with their Amazon account and a system tracks when more detergent and dryer sheets are needed. Whirlpool has partnered with the Amazon Dash Replenishment Service, which uses that tracking to automatically order more for the user. The system also works with the Nest Learning Thermostat to recognize when users are home or away from home and automatically activate the dryer’s “Wrinkle Shield” or switch to a more energy efficient cycle. “There are lots of products out there that have tech and flash, but we would rather spend the time to figure out what consumers really want — and apply it,” says Lindstrom.